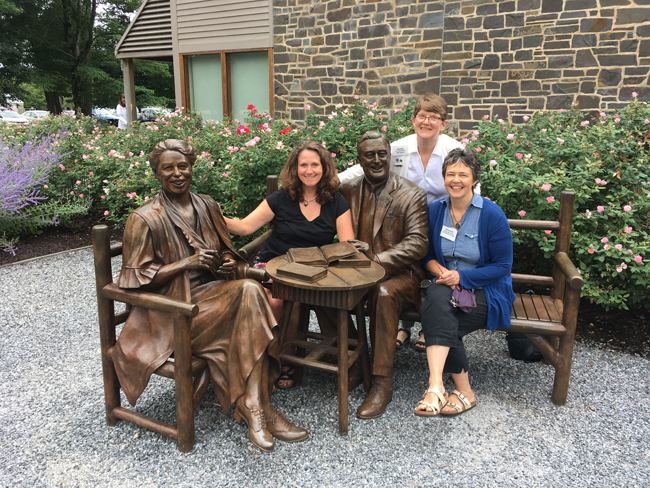 Kingston, NY, September 5, 2017 - This past July, New York Sea Grant partnered with Cornell University’s Institute for Resource Information Sciences to bring a National Geographic Alliance-sponsored New York State Giant Traveling Map to the 2017 Teaching the Hudson Valley (THV) Summer Institute, "Building Community with Place-Based Learning," at the Henry A. Wallace Visitor & Education Center, FDR Home & Presidential Library in Hyde Park NY. THV helps educators discover, appreciate, and share the region’s natural, historic, and cultural treasures with children and youth, fostering collaboration among organizations. Nordica Holochuck, New York Sea Grant's Hudson Estuary Specialist said, “Building community with place- based learning naturally requires understanding where we live, work and play along varying scales (local to global). 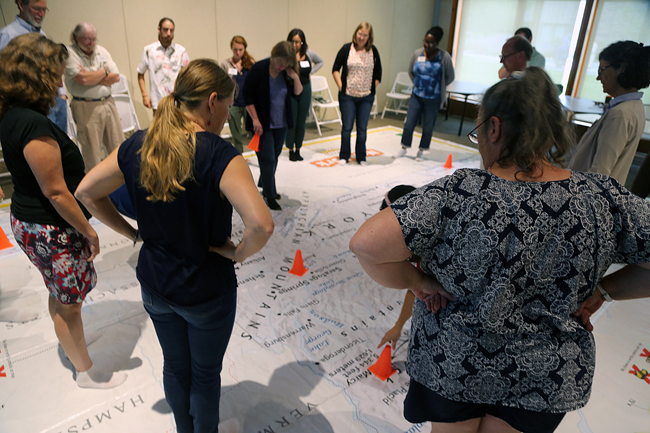 Our workshop at this year’s institute aimed to introduce educators to a newly developed resource, a classroom sized 16x20 foot giant New York State floor map available on loan, free of charge for use at their schools." Approximately 20 educators participated in the well-received two hour workshop, several reporting that they would indeed seek to host the map at their schools. Co-presenter Susan Hoskins, Cornell University Senior Extension Specialist (whose program hosts the map) said, “Educators from the Hudson Valley jumped in the both feet, literally, to explore map reading, spatial thinking and place-based learning on the New York Giant Traveling Map. Measuring the length of the Hudson River on the floor map with heel-to-toe footsteps gave a new spatial understanding of the geography of place and community." Workshop attendees were provided with geospatial learning resource fact sheets and information about the NYS geospatial alliance map loan program. The National Geographic-generated activities that come with the map are geared for younger (elementary) grades. Holochuck looks forward to working with Hoskins this fall to develop a NYS coastal/water resources specific brief to be included with the map lesson plans as it travels to classrooms throughout New York State. 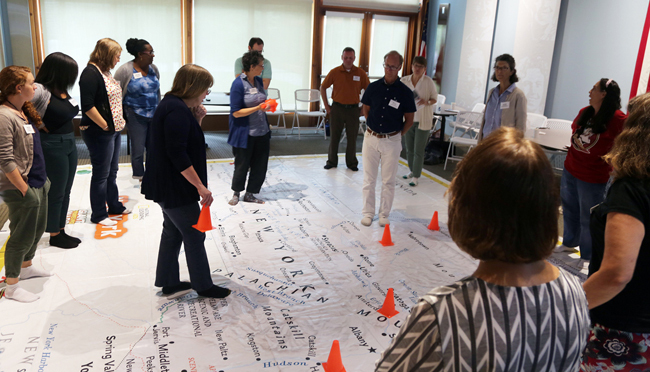 For resources from the workshop, including those from "Hands (& Feet) on Learning: NY Giant Traveling Map," visit Teaching the Hudson Valley's Web site.